Coralie is a certified trainer for Icelandic horses (FEIF level I, acknowledged internationally & by the USIHC). She teaches & trains out of Monument, Colorado. She also travels frequently around the country to show, train, teach & further educate herself as well as maintain a tight contact to other Icelandic horse trainers & breeders. Coralie was born in Switzerland and lived there until 2006 when she moved to Colorado. She began riding at the largest Icelandic horse stable in Switzerland at the age of 12, gaining experience about this special breed through regular lessons and the ability to ride a wide variety of different Icelandics. A year off college enabled an internship at this big ranch where she gave lessons, worked with young horses and helped manage the herd of around 100 horses. 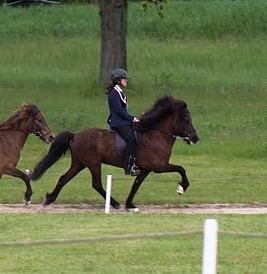 She passed her advanced riding batch specialized in Icelandics in 2005. After the internship Coralie continued giving lessens & assisting at the ranch until she moved to the United States. Shawn maintains & fixes anything & everything at the barn. He is an important factor in keeping it all going. Although not really into horses, he loves them all, especially little Aradis, whose birth he was lucky enough to witness. TAMANGUR Icelandic Horses was founded in 2008. Its goal is to promote the Icelandic horse in the Rocky Mountain area, especially in Colorado, by introducing riders & horse people to the specialties of the breed through lessons, test rides & shows as well as providing sales horses for interested buyers in the region. TAMANGUR Icelandic Horses is named after a forest in a secluded Swiss mountain valley. This pure stone pine forest is the highest & largest in Europe. It has a deep meaning for the local population & is believed to be inhabited by nature spirits similar to the ones of Iceland. These spirits, the Icelandic sounding name & its Swiss origin is why TAMANGUR seemed to be the perfect name for our business.